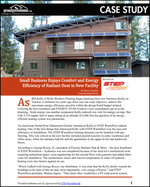 As Bill Kelly of Kelly Brothers Painting began planning his new business facility in Truckee, California two years ago there was one clear objective: achieve the maximum energy efficiency possible within the design/build budget at hand. With over 5,000 square feet of space at an altitude of 6,400 feet, the question of an energy efficient heating system was paramount. This case study explains how the owner decided that radiant heating was the best option, providing instant comfort and savings.